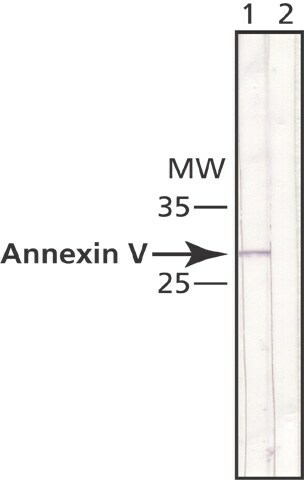 Full length native protein (purified) corresponding to Human Annexin V/ANXA5. Our Abpromise guarantee covers the use of ab49823 in the following tested applications. Indirect ELISA Use at an assay dependent dilution. WB Use a concentration of 0.5 - 1 µg/ml. Predicted molecular weight: 38 kDa. Lanes 1 - 4: Merged signal (red and green). Green - ab49823 observed at 35 kDa. Red - loading control, ab176560, observed at 50 kDa. ab49823 was shown to specifically react with Annexin V/ANXA5 in wild-type cells as signal was lost in Annexin V/ANXA5 knockout cells. Wild-type and Annexin V/ANXA5 knockout samples were subjected to SDS-PAGE. Ab49823 and ab176560 (Rabbit anti-alpha Tubulin loading control) were incubated overnight at 4°C at 0.5 µg/ml and 1/20000 dilution respectively. 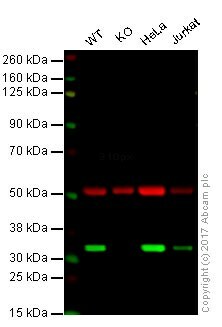 Blots were developed with Goat anti-Mouse IgG H&L (IRDye® 800CW) preabsorbed ab216772 and Goat anti-Rabbit IgG H&L (IRDye® 680RD) preabsorbed ab216777 secondary antibodies at 1/20000 dilution for 1 hour at room temperature before imaging. Publishing research using ab49823? Please let us know so that we can cite the reference in this datasheet. There are currently no Customer reviews or Questions for ab49823.